If you make things with yarn, cloth, or fiber, or want to learn how, join us for a biweekly fiber arts meetup group, facilitated by the library. Every skill level welcome! Bring your current projects and fiber arts questions, and enjoy music, snacks, and conversation while you work. 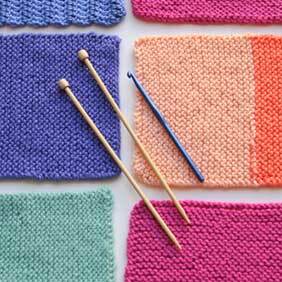 The library’s resident “crochet mentor” Rebekah Jarvis-Girtler will be on hand for crochet lessons and assistance, and can also help you get started with basic knitting and felting. To meet the needs of all schedules, we alternate between daytime (2-4pm) and evening (6-8pm) meeting times - you may attend one or both! Stay for the full session, or just hang out for part of it. Please register below for the daytime sessions. If you would also like to join us for the evening sessions (or prefer evenings only), click here to register. Want to keep in touch with group members? Join the discussion on Meetup! What fiber arts projects do you enjoy working on? Any notes or special requests you'd like to share with the instructor?